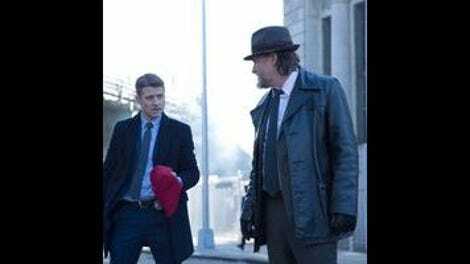 For the most part, the quality of Gotham from one episode to the next hinges on the case of the week. It’s clear at this point that the show is focused on being a procedural, and as with most procedurals, each episode relies on its new bad guy to make the more formulaic elements compelling. This season, the weekly villains have been a mix of laughable cronies and canon characters that only serve as empty fan service. While “Red Hood” once again introduces a canon character, it doesn’t fall into the same trappings of earlier episodes. Instead, “Red Hood” uses its titular character as a way of exploring more complex, dense issues related to the city of Gotham. Red Hood is a canon bad guy, sure, but in this episode, he’s merely a result of the larger problems that have infected Gotham. For perhaps the first time this season, Gotham actually feels like a show that’s about the city, and how that city might come to produce not only hardened supervillains, but also a caped vigilante. There are two central storylines that drive the episode, and they share thematic territory. In one storyline, Bullock and Gordon investigate a series of bank robberies executed by the newly-named Red Hood Gang. In another, an old Secret Service buddy of Alfred’s tracks him down in the hopes of getting his life back on track. The storylines aren’t connected on the surface, but both serves to deepen our understanding of Gotham and the central characters. They both speak to issues of identity, power, and corruption in a meaningful, subtle way, something that the show hasn’t been able to pull off so far this season. The opening bank robbery scene, which strangely takes a few cues straight from Quentin Tarantino (the banter about the homemade hood, and the cop missing his mark with six shots), establishes Red Hood in the best way possible. In almost every episode this season, the canon characters have been given too much narrative to carry, their actual significance to the story not nearly matching up with their perceived significance. The introduction of Red Hood is different though; he’s never forced to carry the episode, and his inclusion isn’t seen as something monumental. Rather, it’s a low-key introduction, and the character serves as an insight into Gotham as a whole. After robbing the first bank and delivering a rousing speech about how bank’s exploit their customers, and that the criminals are only stealing from the bank, not the people, Red Hood is established as an outcome of a broken system, not some random villain with no purpose or motive. When he throws around some of the money to the citizens of Gotham, it’s not only a way to block the police, but also a look at just how corroded this city is, and how exploitation and class division can create dire circumstances for the city’s inhabitants. Even as the red hood itself changes hands (or heads), it stands as a symbol of Gotham’s problems with inequality. Now, when the Red Hood Gang robs a bank, the citizens are expecting a handout; it’s part of the philosophy of the gang now. What’s important about Red Hood, no matter who is wearing the mask, is that, within this episode, he’s representative of a system that’s broken. The bank robberies, and the public’s reaction to them, is indicative of how marginalized the people of Gotham are. There’s staggering wealth inequality, and that breeds a whole host of issues that infect and erode communities and cities. These are the nuances in storytelling that have been missing from Gotham so far. That nuanced storytelling extends to the Bruce-Alfred storyline. Reginald Payne, an old friend of Alfred’s from his time in the Service, shows up at Wayne Manor hoping to have a hot meal and a place to stay for a few days. Bruce, being the gracious host that he is, insists that he’s welcome. Alfred is clearly excited to see his friend, but also wary of the change in the status quo this could bring about. It’s not long before Payne is inserting himself into Bruce and Alfred’s life, showing Bruce ways to fight that don’t match up with Alfred’s philosophies, and detailing war stories that the butler would rather leave in the past. The storyline thrives on its insinuated backstory, one that doesn’t need to be fully revealed. We can draw conclusions about the relationship between Alfred and Payne just from their body language; revealing too many details through exposition, as is often the case on this show, would only serve to bog down the story. Instead, the storyline builds enormous tension by remaning secretive. We can sense that Payne is trouble, but we can’t quite pin down his intentions. Gotham has a habit of telling rather than showing, so seeing this story play out in such a patient way is refreshing. And if that isn’t enough, the storyline builds to perhaps the first significant cliffhanger of the season. After stabbing Alfred in a confrontation, one that we’re lead to believe happens because Payne is simply stealing from Wayne Manor in order to set himself up financially for the future, it’s revealed that Payne has been paid by the board members of Wayne Enterprises to find out what Bruce knows about their shady dealings. He steals a bunch of files from Bruce’s desk and reports back to the board members, telling them that with Alfred in the hospital for the next few weeks (if he lives), now is the time to go after Bruce and his inherited power. The scene is beautifully shot, and it starts to put some pieces into place for the power struggle that could occupy the rest of the season. “Red Hood” succeeds because it tells the story of the people of Gotham. It focuses on character relationships and relevant themes of power and corruption, and never relies on hacky, cartoonish comedy to distract us from any disjointed storytelling. “Red Hood” is a focused, compelling, thematically complex episode of Gotham; hopefully, going forward, it isn’t the exception that proves the rule. More great thematic and world-building work from this week: Cobblepot learns that the booze in his club, and in the whole surrounding area, is supplied by Maroni. That means nobody would dare cross Maroni and sell to Cobblepot. It’s a nice, simple touch that lets us know just how deeply-rooted the mob connections are in Gotham. Thankfully for Cobblepot, Butch saves the day with the help of a few crooked cops. The show is doing a nice job of suggesting that, despite how intimidating and smart Cobblepot has been throughout the season, he may have underestimated what it takes to remain in power. Mooney’s storyline doesn’t move too much this week. She meets with the “manager” of the weird limb-harvesting facility she’s staying in, who offers her a shower and then tells her that she’s not leaving the room in tact; he wants her eyes. Rather than give in to him, she scoops out her own eye with a spoon and steps on it. I have no idea where any of this is going or why it’s important, but the ambiguity is kind of fun. Barbara is still hanging out with Selina and Ivy, trying her best to be a cool sleepover buddy that does makeovers and drinks during the day. I have no more patience for the way female characters are written on this show. Another subtle piece of character development: when Bruce calls 911 after Alfred is attacked, he says, “my friend has been stabbed.” It’s a small, touching moment that builds the connection between these characters in an organic way.